This piece was written after the passing of Dr Syedna Taher SaifuddinRA in November of 1965. His death anniversary is on the Hijri date of 19 Rajab al-Asab, which this year falls on 4 April. While talking of progress among a group of people, an organization or community, it is important to realize that the element of continuity has an abiding relationship to progress. A correct assessment of progress cannot be made without reference to continuity and continuity cannot be established if there is no progress. This is all the more true of an organization or association, which has fairly well formulated objectives before it. No doubt, it is always more problematic to decide what should be called progress. Progress has to be related to the essentials of the outlook, beliefs or principles, which a particular group of people hold or practice. Strange as it may appear, even deterioration could be continuous, and there could be progress in deterioration. The Dawoodi Bohra Community, in November last, received a jolt, which in its impact and dimension was unparalleled. Under the leadership and direct guidance of His Holiness Dr. Syedna Taher Saifuddin Saheb, the 51st Dai-el-Mutlaq, there were tremendous programs of development being conceived and executed at a pace unprecedented in the history of the community. At the age of 80, he had the same alertness of mind and body, which he had possessed 53 years before when he succeeded the exalted office. Therefore, one could easily say that the vast mechanism of the Dawat organization was functioning not only at his bidding and command but under his direct attention and care, meticulously focused on problems as they arose and effectively harnessed to their solution, hour after hour and day after day. It was the night of Friday, 19th of Rajab. At midnight, in a matter of minutes, he passed on to eternity. Every incident connected with that tragedy, preceding it or coming in its wake, points to two most eventful and miraculous phases, the like of which have never been witnessed in our long history. Because of the fact that there existed between him and the bulk of his followers the relationship of a father to his children and because of the fact that in every sphere of the organized life led by the community in this world there was his personal, affectionate and realistic touch and, what is more, a touch that was distinguishable and intrinsically different – because of this fact, it is understandable that a tidal wave of grief, shock and sorrow could have engulfed the whole Dawat administration and the great magnitude of his followers. In the suddenness of that event and the immensity of that grief, there was also a lurking fear, though none dared express it, that the late Syedna, by virtue of his unique personality, had raised the administration of Dawat to such a peak of efficiency that it would be impossible for his successor, however distinguished he might be, to carry on and keep up the thread of continuity and progress. When tears rolled down the eyes of his followers, even of school children thronging in their thousands to offer their respectful condolences to the successor Dai, practically everyone had some vague, indescribable fear and sense of total loss – a feeling of having been orphaned forever. 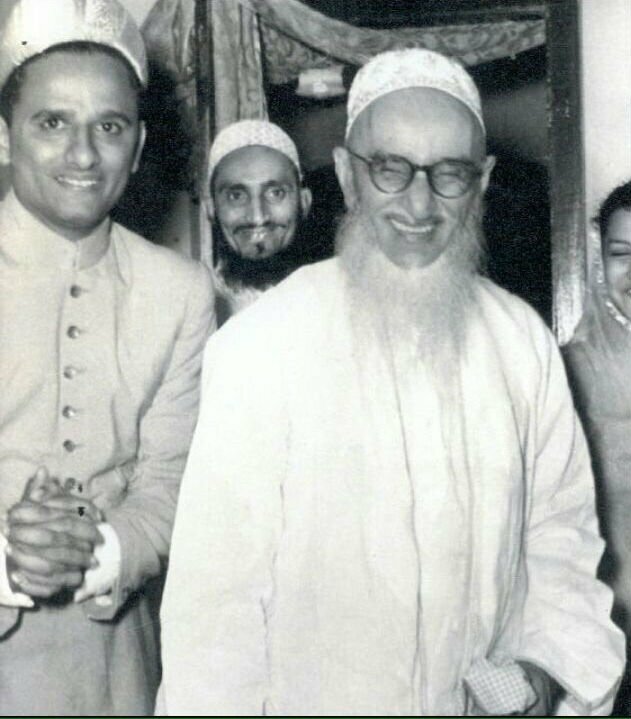 History will have to admit that as there was a uniqueness in everything that His Holiness Dr. Syedna Taher Saifuddin did. Unobtrusively, but most effectively, the progress of the training of his successor had gone on for 53 years, and while paying tribute to his predecessor for the quality and range of that process, credit must also accorded in equal manner to the recipient of that training. What happened from the fateful moment of Friday night onwards could be described in a single sentence. His Holiness Dr, Syedna Taher Saifuddin retired to his bedroom after finishing his work, and shortly afterwards, the successor designate, His Holiness Dr. Syedna Mohammad Burhanuddin Saheb, was called in; and in a matter of agonizing seconds, it was the successor, His Holiness Dr. Syedna Mohammad Burhanuddin who came out, a great change having taken place meanwhile and an onerous charge having been handed over. From that point of time onward, if one were to try to separate the great feeling of shock, sorrow and grief from the immediate tasks of issuing directives to the administration and from the process of guidance that was at once needed for uninterrupted functioning of the whole organization of Dawat – if one were to draw a line between these two aspects of the emergent situation – then one could easily say that on Friday nothing unusual seemed to happen. There was an interchange of persons – or rather an interchange of age. It was as if the older leader – transformed into the person of the younger one – reappeared on the scene, with everything going on as usual and not the slightest break occurring in the process of administration. Next articleObituary: Mazoon al-Dawat, Syedi Qasim bhaisaheb Hakimuddin.